Mehron improved Mixing Liquid now contains Fixative. 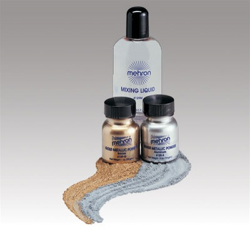 This Mixing Liquid is a liquid base for mixing with dry pigments such as Mehron Metallic Powders. Create a liquid application that dries completely with Mehron Mixing Liquid and dry colour pigments. The Mixing Liquid holds for extended periods of time but still washes off easily with soap and water. The Mixing Liquid enables you to make unique liquid makeup for special projects in body painting and face painting. To apply mix a little mixing liquid with a metallic powder such as Mehron Metallic Powder such as gold. This can then either be sponged or painted on. Alternatively you can apply with your hands. Aqua/Water/Eau, SD Alcohol 40-B (Alcohol Denat. ), Acrylates/Octylacrylamide Copolymer, Triethanolamine, Decylene Glycol, Methylisothiazolinone. EYE: LIQUID AND VAPOUR MAY CAUSE IRRITATION .SPLASHES MAY CAUSE TEMPORARY PAIN AND BLURRED VISION. INGESTION: CAN CAUSE DEPRESSION OF THE CENTRAL NERVOUS SYSTEM, NAUSEA. EXTINGUISHING MEDIA: DRY CHEMICAL, ALCOHOL FOAM, CO2, WATER MAY BE INEFFECTIVE BUT SHOULD BE USED TO KEEP FIRE-EXPOSED CONTAINER COOL. UNUSUAL FIRE OR EXPLOSION HAZARDS: ABOVE FLASH POINT, VAPOUR-AIR MIXTURES ARE EXPLOSIVE. FIRE-FIGHTING INSTRUCTIONS: IF LEAK/SPILL HASN’T IGNITED, USE WATER SPRAY TO DISPERSE VAPOUR AND PROTECT PEOPLE ATTEMPTING TO STOP SPILL. IN THE EVENT OF FIRE, WEAR FULL PROTECTIVE CLOTHING AND NOISH-APPROVED SELF-CONTAINER BREATHING APPARATUS. SPILL/LEAK PROCEDURES: VENTILATE AREA OF LEAK OR SPILL. REMOVE ALL SOURCES OF IGNITION. WEAR APPROPRIATE PERSONAL PROTECTIVE EQUIPMENT. ISOLATE HAZARD AREA. CONTAIN AND RECOVER LIQUID WHEN POSSIBLE. USE NON-SPARKING TOOLS AND EQUIPMENT. COLLECT LIQUID IN AN APPROPRIATE CONTAINER OR ABSORB WITH INERT MATERIAL AND PLACE IN CHEMICAL WATER CONTAINER. DO NOT FLUSH TO SEWER. HANDLING ADVICE: PROTECT AGAINST PHYSICAL DAMAGE. STORE IN A COOL, DRY, VENTILATED LOCATION. KEEP AWAY FROM SPARKS AND FLAME. AVOID CONTACT WITH EYES. KEEP CONTAINERS CLOSED. CHEMICAL INCOMPATIBILITIES: STRONG OXIDANTS, SILVER SALTS, ACID CHLORIDES, ALKALI METALS, METAL HYDRIDES HAZARDOUS DECOMPOSITION PRODUCTS: CARBON DIOXIDE, CARBON MONOXIDE. DISPOSAL: CONTACT YOUR SUPPLIER OR A LICENSED CONTRACTOR FOR DETAILED RECOMMENDATIONS. FOLLOW APPLICABLE FEDERAL, STATE AND LOCAL REGULATIONS. I have yet to use this product. It arrived quickly and well packaged but disappointed that the mixing liquid had leaked despite the lid being screwed on tightly.